A few weekends ago we hit the road for a mini vacation with our pals in Fresno. (“Fresno? ?”) Yes. Fresno. We love going there—our friends Dan & Lisa are a blast to hang out with and Wolfie adores their two kids Ben and Emmy. They have a really cool house on a cul de sac and I always feel like I’m hundreds of miles away from the crazy city. (Which I guess I actually am, so bad example.) ANYWAY! 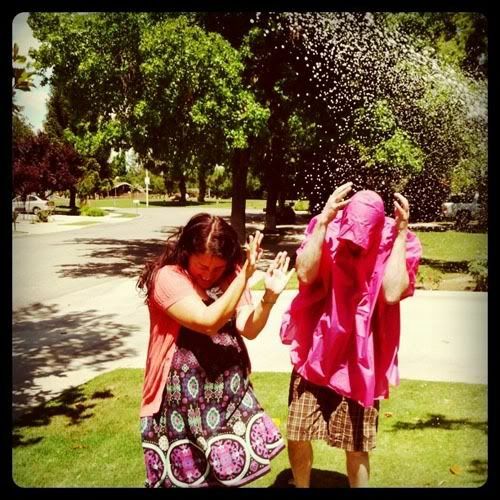 In addition to swimming and BBQ-ing and chilling, we always end up doing something goofy and fun. 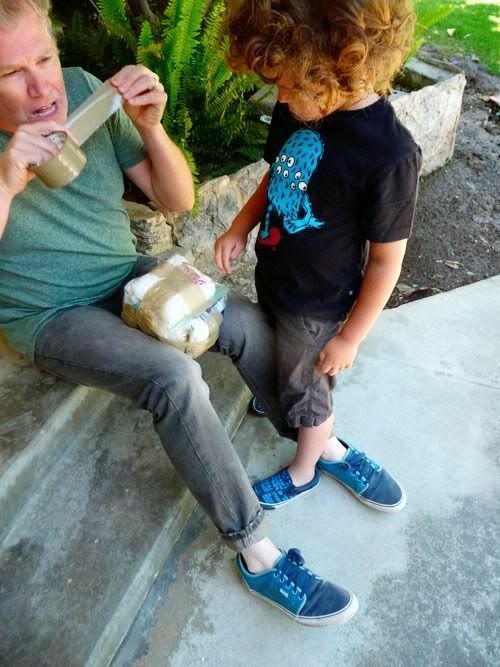 This time it was helping Wolfie with his school project….THE EGG DROP. 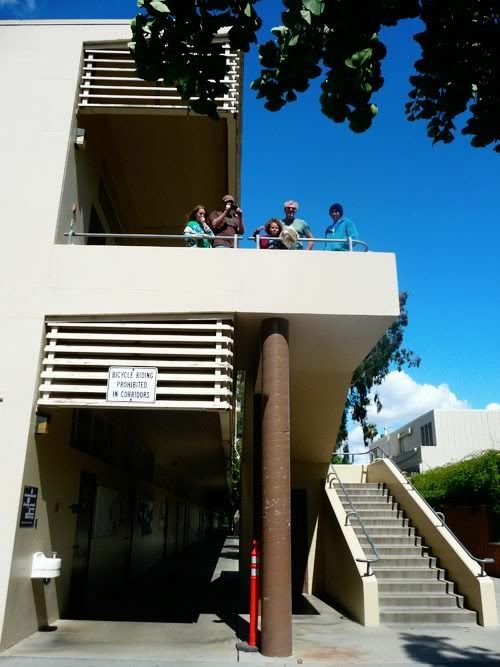 THE ASSIGNMENT: Create a container in which an egg could be placed and dropped from the roof of the school without breaking. After much consultation we decided we would stuff six zip lock sandwich baggies with recycled plastic bags and tape ’em all together to form a cube. 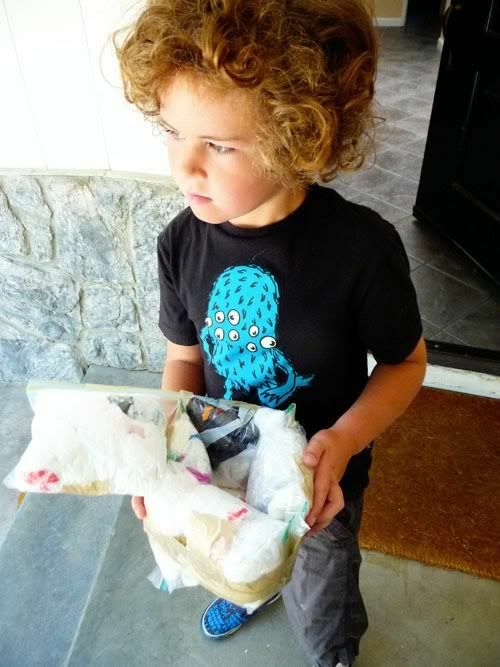 It worked really well and we liked the idea of re-using all those pesky plastic bags laying around. 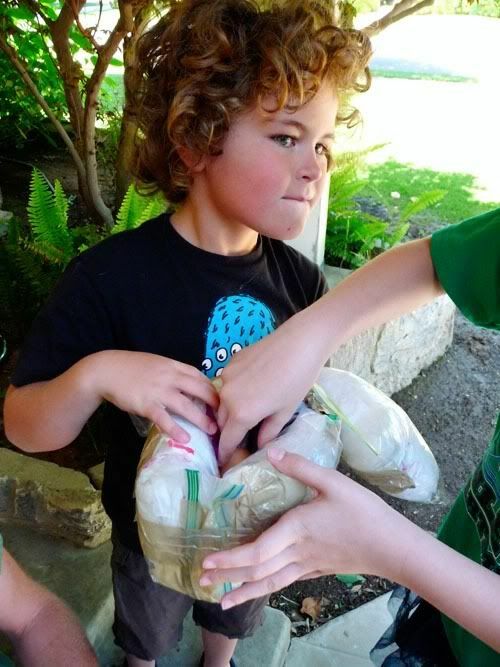 We need to add a little extra baggie action to make sure the egg fit snuggly…. Kiddos, don’t try this at home! 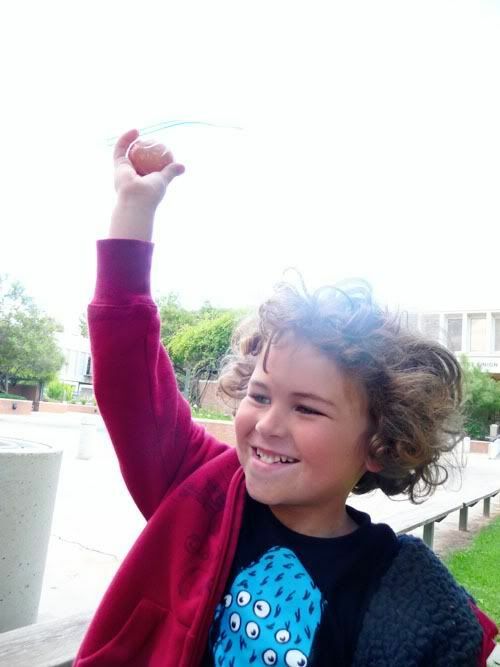 Cousin Ben climbs up on the roof and the egg survives! But we didn’t stop there. We decided to try one more round….could we beat the zip lock cube? 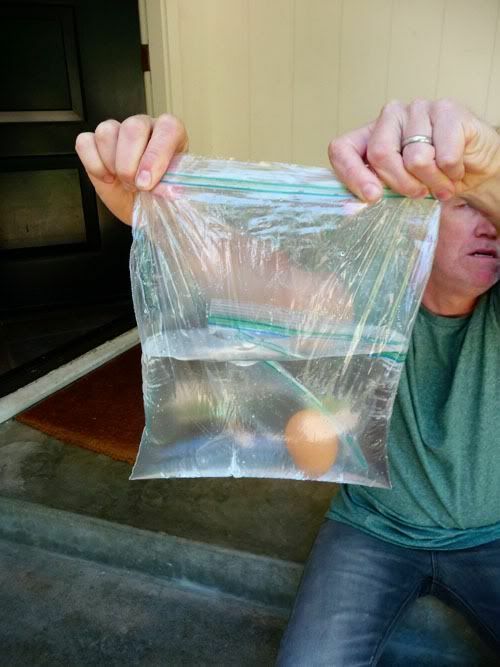 AWolfie had the idea to put the egg in a bag of water, inside another bag of water—his theory being that it would float. Sound crazy? Sure….but we knew it would make an awesome SPLAT as it dropped. The big surprise? 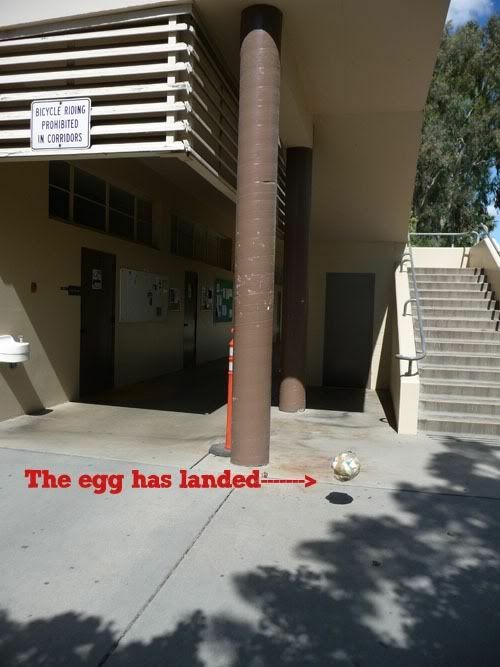 THE EGG SURVIVED! But the outer bag did burst and got water everywhere. It was rather spectacular. 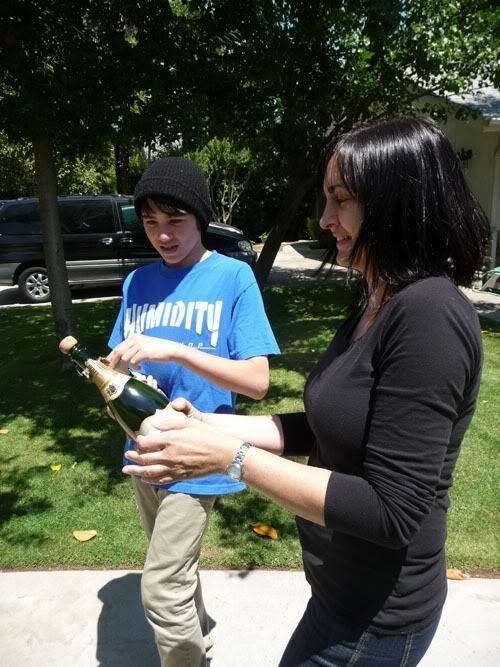 Then it was time to celebrate, and Ben and his mama Lisa got the champagne ready for the Big Shower. Another successful Fresno Weekend. We’ll be going back for the Fourth of July. And for the record, Wolfie’s egg was one of a select few that survived the drop off the roof of his elementary school! 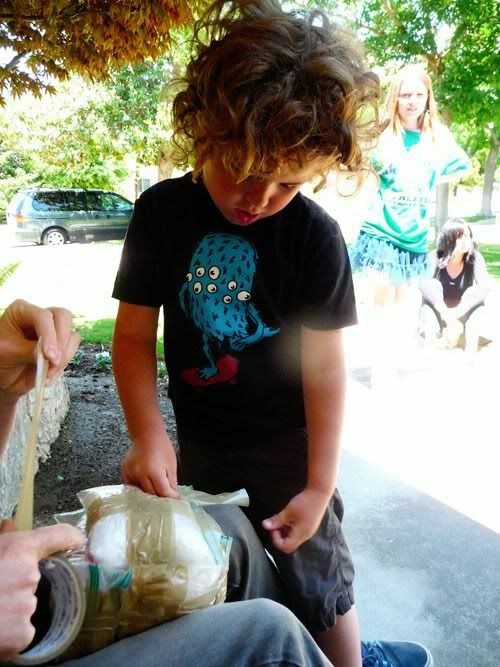 Tagged with Egg Drop, Fresno. I am sharing this everywhere AS WELL as testing it out with all the kids I work with THIS WEEK! YOU ARE AWESOME and I now am following your blog. Hahahahah Awesome! The zip lock idea is super cool and smart! science is cool!!! i love wolfie’s water bag idea!! Strange seeing familiar surroundings. I am a Fresno reader. 🙂 Hope you enjoyed the heat. Hey Fresno! We’ll be heading your way for a hotsy totsy Fourth of July too! !